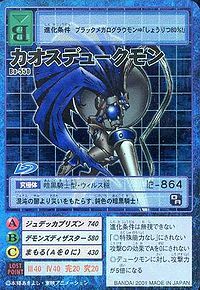 Another form of Dukemon, which has awoken to its instincts as a Virus-species. Its heart and thoughts are completely Dark Side, and it is nothing more than the "Digital Hazard" that brings calamity to the Digital World. 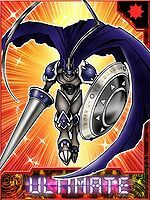 It is clad in black, demonic armor refined from high purity Chrome Digizoid just like Dukemon, and its right hand can become the demonic lance "Balmung" while its left hand can become the demonic shield "Gorgon". It is definitely a being set in opposition to Dukemon. Its Special Moves are the powerful barrage of attacks of its demonic lance (Demon's Disaster), and firing a dark wave which corrodes everything from the demonic shield in its left hand (Judecca Prison). 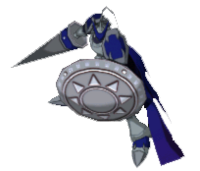 A Dukemon which has awoken to its Virus-species instincts. Its heart and thoughts are completely tainted by the Dark Side. It is definitely a state in which the "Digital Hazard" has been triggered. 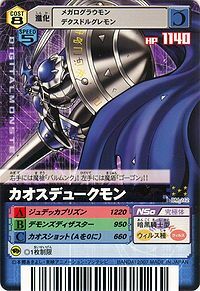 As another form of Dukemon which has awoken to its Virus-species instincts, its heart is completely tainted by darkness and it is the epitome of the "Digital Hazard". 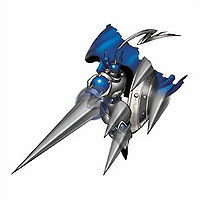 Its body is clad in demonic armor made of "Chrome Digizoid", and it holds the demonic lance "Balmung" in its right hand and the demonic shield "Gorgon" in its left. 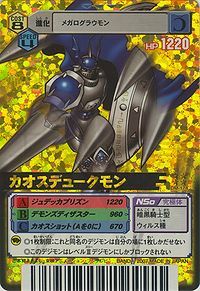 Another form of Dukemon, which has awoken to its instincts as a Virus-species. Its heart and thoughts are completely Dark Side, and it is nothing more than the "Digital Hazard" that brings calamity to the Digital World. 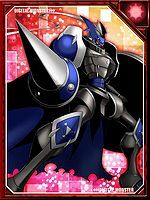 It is clad in black, demonic armor refined from high purity Chrome Digizoid just like Dukemon, and its right hand can become the demonic lance "Balmung" while its left hand can become the demonic shield "Gorgon". It is definitely a being set in opposition to Dukemon. | Dukes are high-ranking nobles. | Gallant means depicting nobility and selflessness. 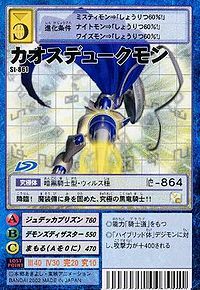 Anime/Manga Digimon World Re:Digitize Encode: "Top Floor"
[N 1] ジュデッカプリズン Judekka Purizun Mystic Pulse/Judecca Prison Unleashes Gorgon's dark corrosive power in one super-surge attack. Demon's Disaster  デモンズディザスター Demonzu Dizasutā Chaos Disasater/Damaging Pierce/Demonic Disaster A brutal barrage-thrust assault with Balmung, or fires a beam from the lance's tip. Casts a huge sphere of energy around itself using Gorgon. Attacks with its lance Balmung as lightning spirals about the blade. Duke Charge  デュークチャージ Dyūku Chāji Gallant Charge Charges down its enemy with its glowing Balmung. Shoots down from the sky, stabbing with Balmung. 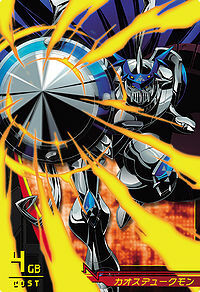 Shield Destructor  シールドデストラクター Shīrudo Desutorakutā Shield Attack Blasts the enemy with energy from Gorgon. Chaos Shot  カオスショット Kaosu Shotto Chaos Crusher Gathers dark energy with Gorgon and fires it with Balmung. A strong blow using Balmung that shocks the enemy. 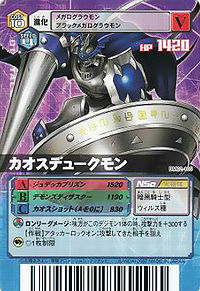 Chaos Dukemon evolves from Black Megalo Growmon. 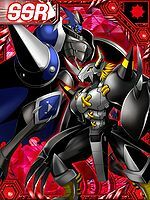 Chaos Dukemon is the partner of Commander Julia. 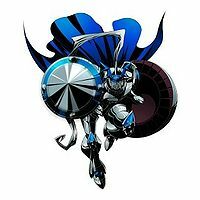 Chaos Dukemon is an unobtainable enemy Digimon. It can only be obtained as a collectible card. 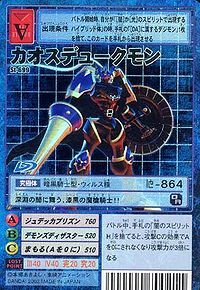 Chaos Dukemon is an unobtainable Leader Digimon. 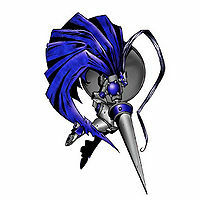 It dances in unfathomable darkness, the jet black demon lancer!! Advent! 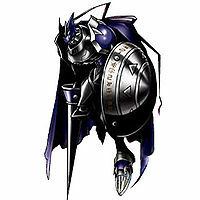 Its body is fortified with demonic gear, the ultimate dark dragon knight!! 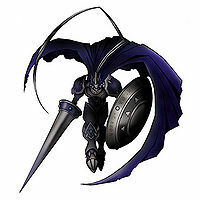 It brings calamity from the chaos of darkness, the dark-colored black knight! In its right hand, the demonic lance "Balmung"! In its left hand, the demonic shield "Gorgon"!! 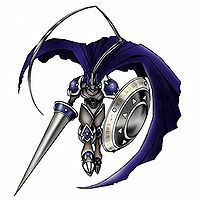 A form of Dukemon that awakened to its Virus instincts. 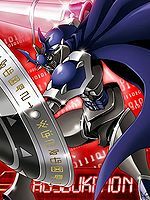 Its body is clad in demonic armor made of black Chrome Digizoid, and is the very personification of the Digital Hazard when equipped with its demon lance Balmung, and demon shield Gorgon. ↑ Judecca is the central point in hell in the epic poem, Divina Commedia (Divine Comedy), named after the biblical figure Judas. ↑ Balmung is the name of Siegfried's sword in the epic poem, Nibelungenlied.